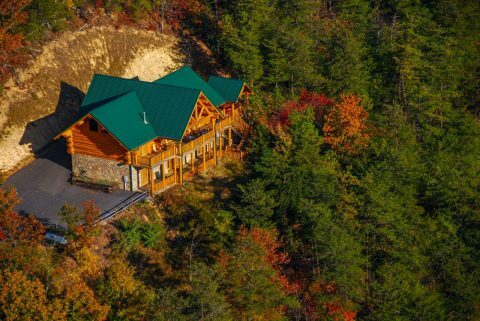 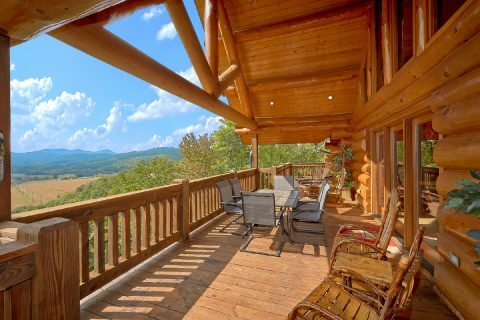 Welcome to "Lodge Mahal," an unforgettable 4-bedroom Smoky Mountain cabin nestled in the mountains between Wears Valley and Pigeon Forge, TN. 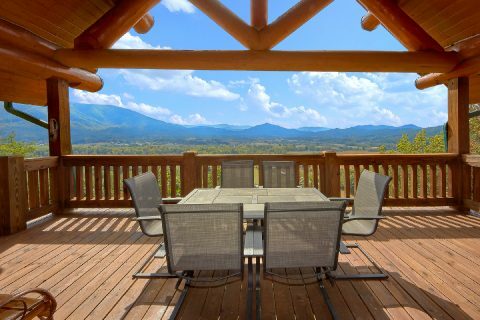 With room for up to 10 guests, this luxury rental is a great fit for family getaways or a vacation with a group of friends. 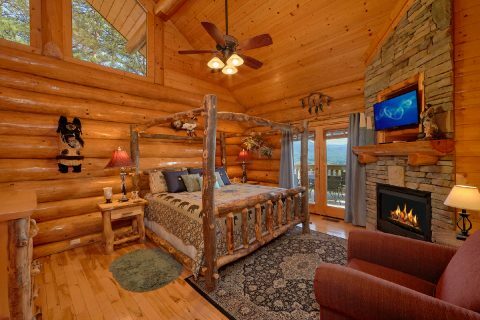 This cabin's 4 private bedrooms provide custom decorated themes and ample space for guests to unwind. 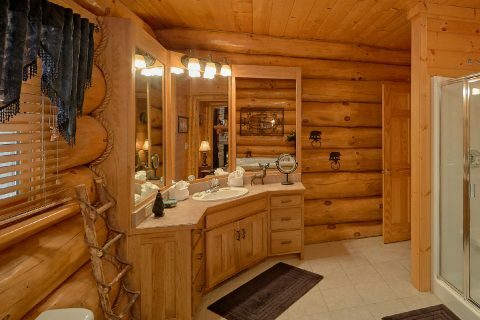 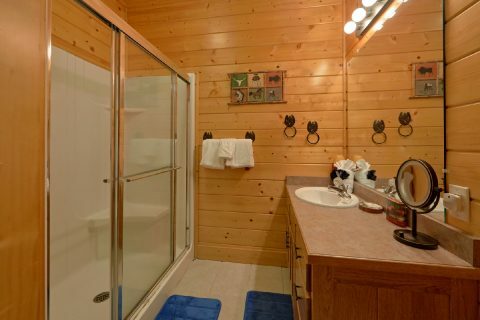 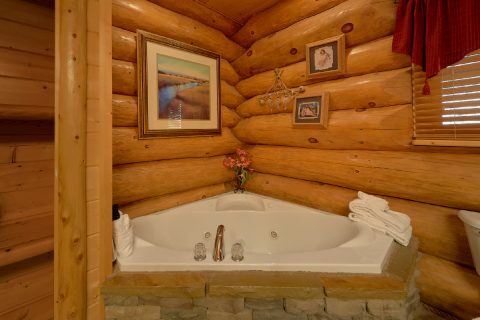 The main level of the cabin offers two king-sized master suites that both provide 32" TVs, DVD players, jacuzzis, fireplaces, and private bathrooms with full showers. 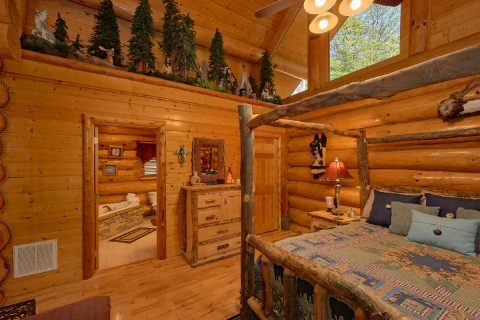 One of these master suites has a lovely, log-frame canopy bed, while the other room provides a sleep number bed. 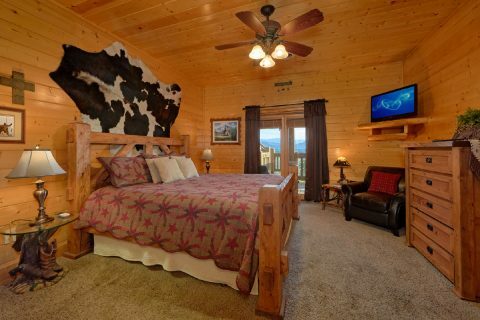 Downstairs, the other two bedrooms offer king-size mattresses, 32" televisions, DVD players, and access to full baths. 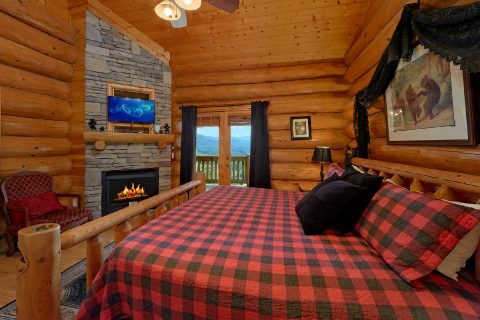 There's also a sleeper sofa in the game room. 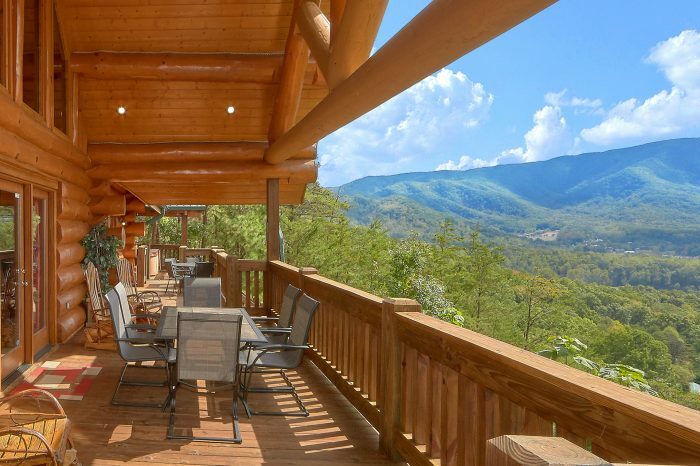 When you wake from a great night's sleep in your luxurious mountain lodge, you'll be ready for a day of adventure in the Smoky Mountains of Tennessee. 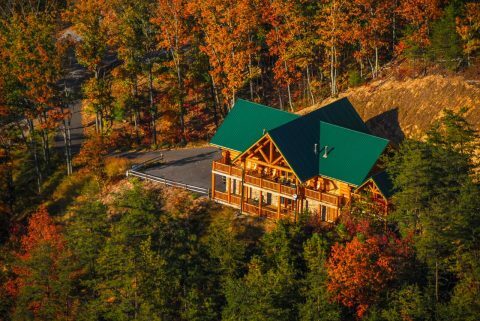 Will you visit the nearby national park? 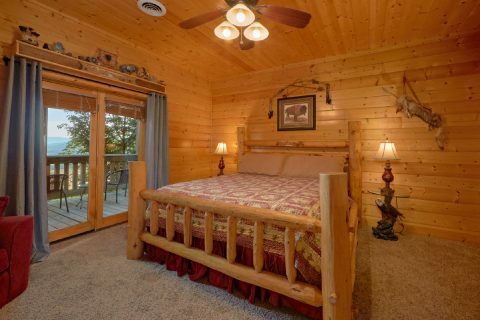 Visit awesome attractions like Dollywood in Pigeon Forge? 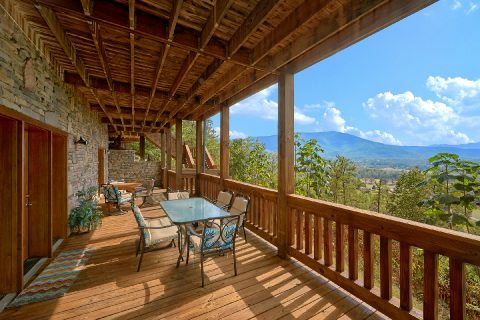 Or find hidden gems in the rustic mountain town of Wears Valley? 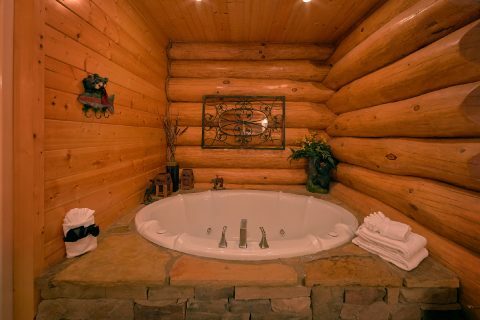 Or instead, why not just relax and have a great time at your premium cabin in the mountains! 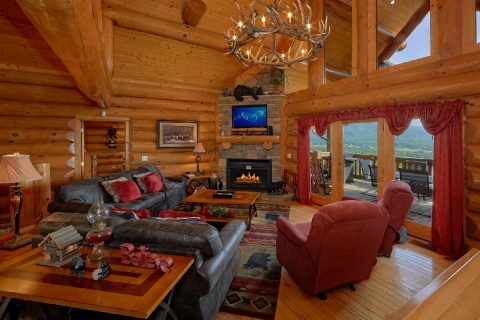 The upstairs living area features stylish décor and large windows to let in natural light and lets guests enjoy the gorgeous scenery that surrounds their cabin. 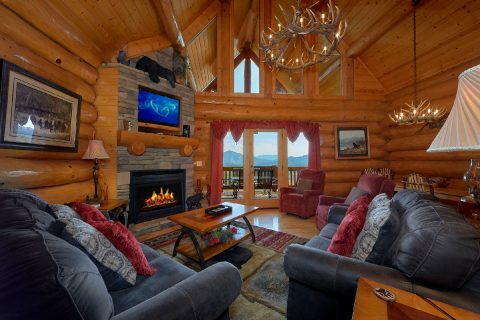 Along with a stacked-stone fireplace, the living room features comfortable furnishings with a 42" widescreen TV. 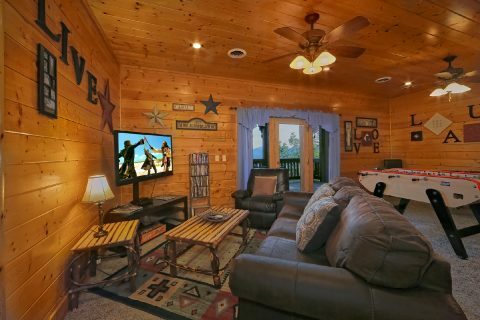 Be sure to take advantage of this rental's DVD player or premium satellite television package with NFL and other premium channels. 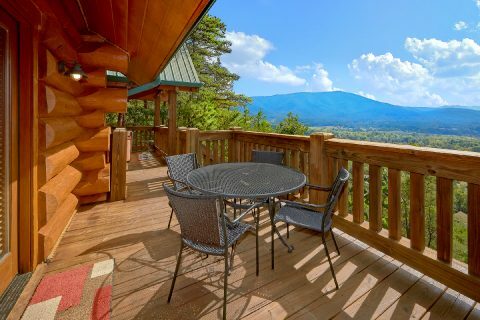 Step outside on to your rental's spacious deck to enjoy the incredible mountain view. 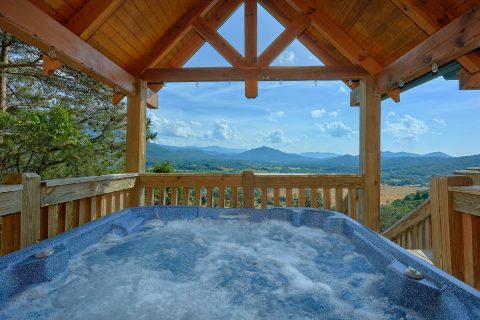 Better yet, you can experience true relaxation by sitting back in a porch rocker or your cabin's year-round hot tub. 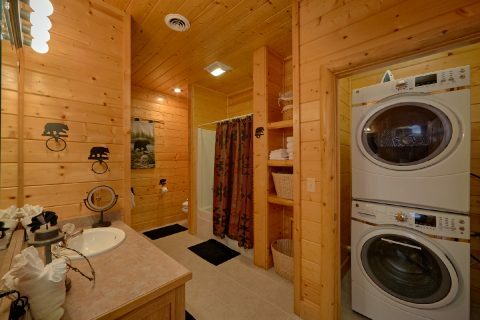 For enjoying delicious, budget-friendly dinners, your cabin comes with a full kitchen with sleek appliances. 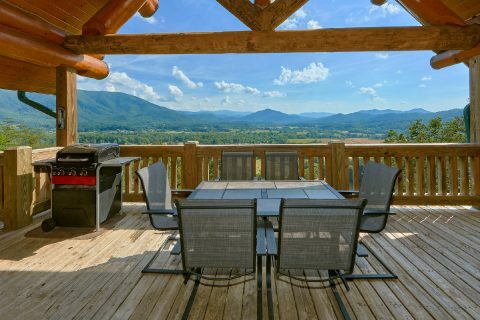 There's also a gas grill and patio furniture on the deck for enjoying a summer barbecue. 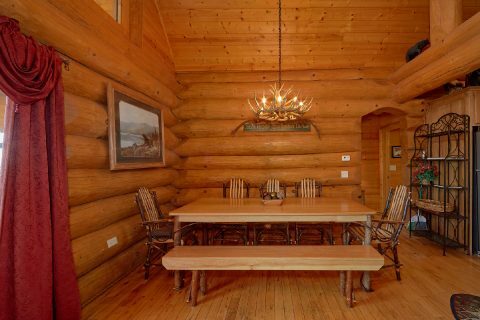 For relaxing family meals, simply take a seat at the luxurious hickory dining table with seating for 8. 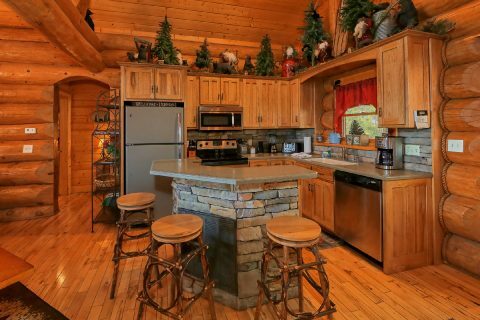 For additional seating, the kitchen features a breakfast bar with seating for 3 more guests. 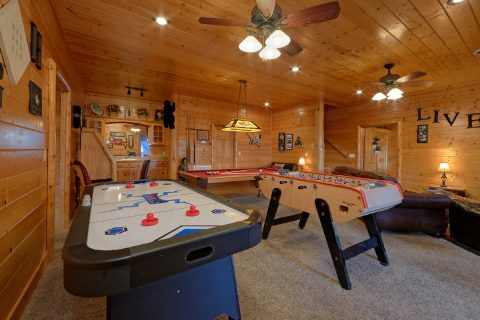 In the downstairs game room, you'll enjoy endless hours of entertainment thanks to an air hockey table, billiards table, PlayStation 2, card table, and board games. 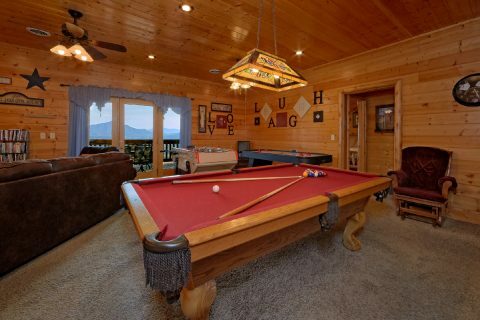 A 42" flat screen television and comfortable furnishings in this room are perfect for watching the big game while you work on your pool shot. 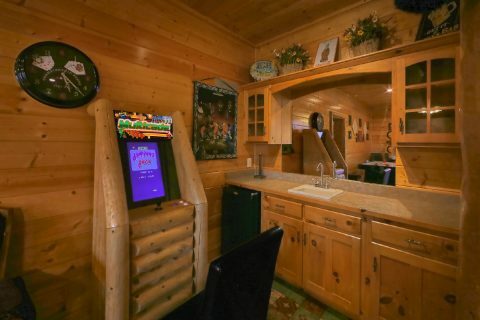 An additional perk of this game room with an air hockey table is the wet bar and mini-fridge for enjoying tasty snacks and drinks. 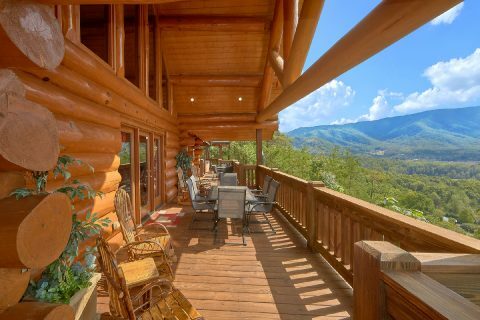 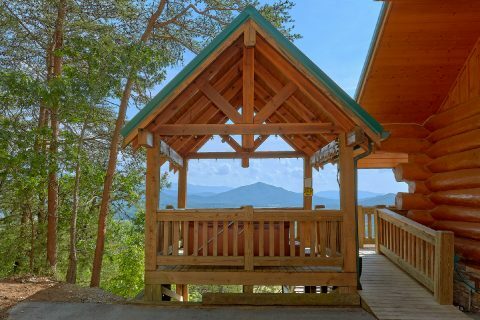 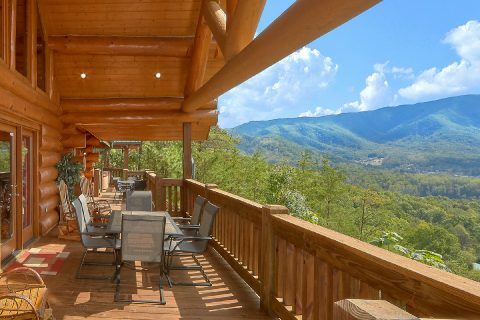 Best of all, this Smoky Mountain rental is convenient to the best sights and attractions in the Smokies like Dollywood and the Great Smoky Mountains National Park. 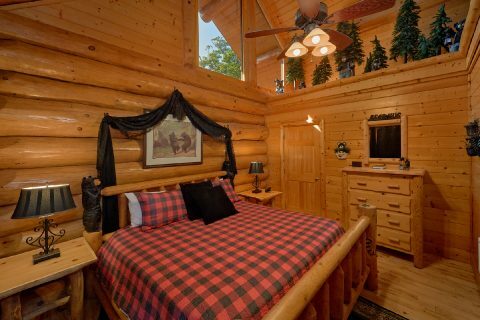 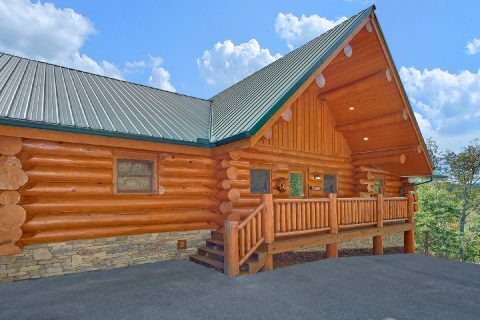 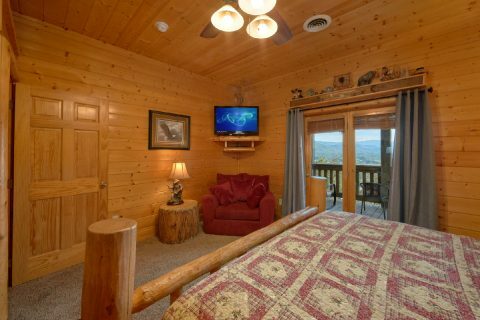 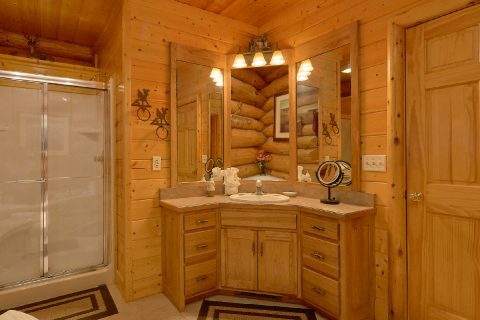 Don't forget to book this premium 4-bedroom online with Cabins USA Gatlinburg to save big with our 15% discount! 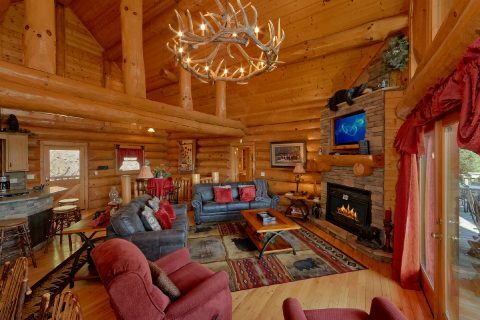 Enjoy a luxury cabin experience for an exceptional price when you reserve "Lodge Mahal" with your family and friends.